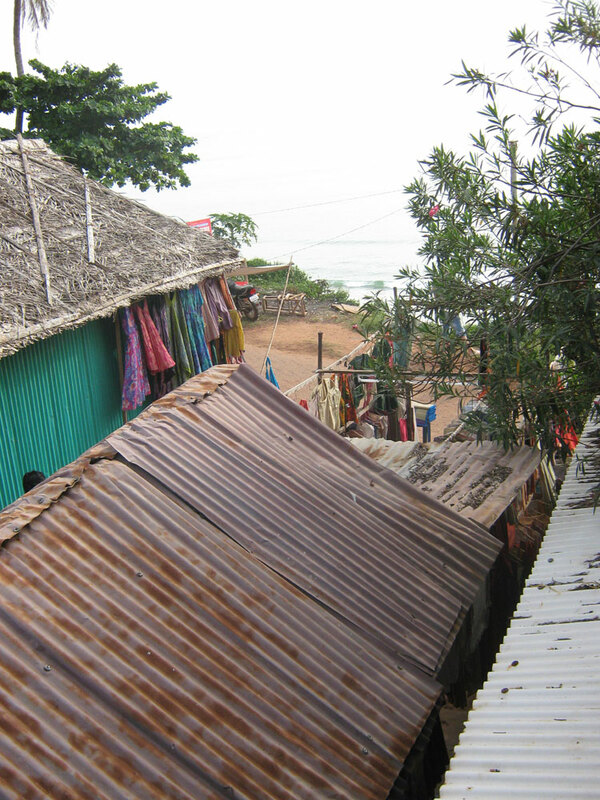 On the way to my first Dravidian flute lesson I was hailed by the tailor whose hut, a corrugated iron-roofed structure with a view out over the Arabian Sea, was en route to the Juice Shack where I had first met Venugoptal. I had visited him the previous afternoon to choose material and have my flute measured for a bag. I had arranged to collect it later in the day but, although it would make me late, I responded to the tailor's enthusiasm in the only way I could. The bag wasn't quite finished so I watched the final stages and specified the length of the draw-string while the proprietor tried hard to persuade me to have some shirts made - a sure sign I had paid too much for the bag. I hadn't haggled on this occasion for two reasons. Firstly, the man had refused to budge on the cost of a dress one of my daughters was keen on but didn't buy. And secondly, I had recently read the story of V.S. Naipaul and the cobbler in 'An Area of Darkness'. 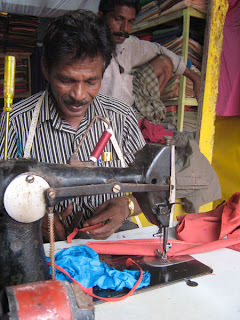 The author had a pair of shoes in need of some stitching and took them to a cobbler in Bombay. He haggled aggressively over the cost of the repair and beat the man down to a very low price. The cobbler took one of the shoes, picked up a four inch nail and promptly drove it through the sole with a hammer. He only returned the shoe with a struggle. I wanted the tailor to make me a quality product. In the end the bag was certainly fit for purpose, although I think my presence distracted him and he let his machine get the better of him. There are a number of unnecessary black stitches near the mouth. When I explained the delay to my teacher, the first thing he asked was the price I had paid for the bag. "Ah," he replied. "You should not have paid more than a hundred rupees for a bag like this." I immediately thought about the sum I had paid him for the flute. However, he assured me the bag was a good idea, and not for the reasons I had supposed. 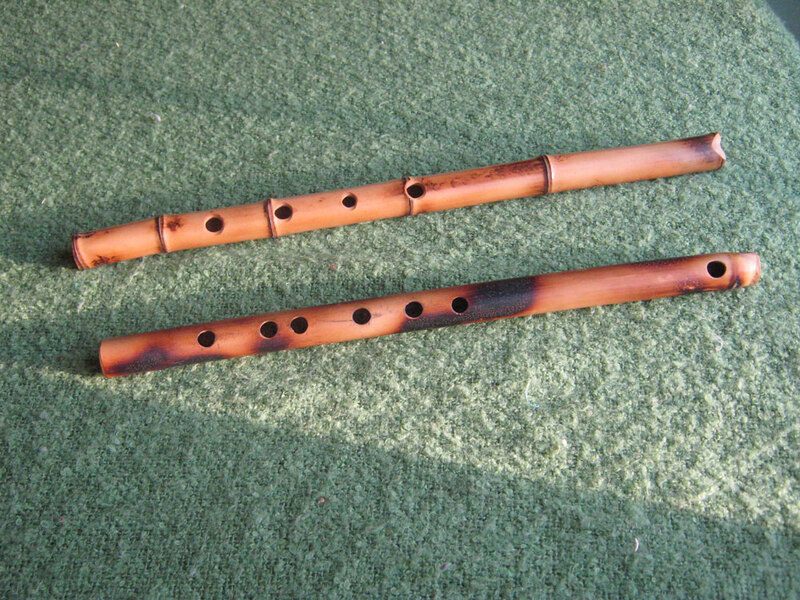 Apparently he had twice been bitten on the lips by insects that had crawled into the warm, damp, dark space inside his flute. The creatures had taken exception when he put the instrument to his lips to blow and inflicted an injury that made it impossible to play for a couple of days, such was the swelling of his lip. This is not a problem I have ever experienced in the UK. And then we went up the rickety stairs to the covered part of the juice bar and got down to musical business. It's good to be back in Norwich Puppet Theatre, working on a new show. This one is called 'There's a Monster in My Piano' and is a Garlic Theatre production. Without giving too much away, it's about a piano with a mysterious monster inside. Touring with a real piano would be a nightmare but this show uses a toy piano. And I don't mean from Woolworths. More on the piano later. Meanwhile, here are some notes from the show. 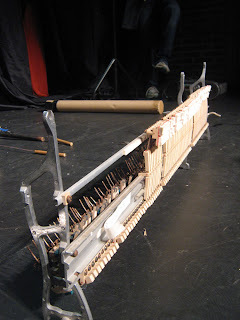 No pianos were harmed during the making of this show. I believe this one was already dead. 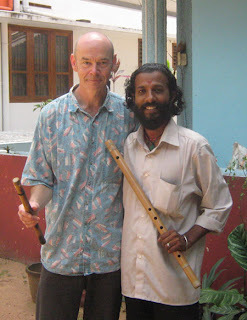 There was no way of knowing the going rate for a hand-made flute in Kerala. I just had to go on Venugopal's open-hearted demeanour. I believed him when he said he didn't really care whether or not he sold a particular flute to a particular customer. Anyone who has visited a bazaar in the 'developing world' and shown even the most cursory interest in an item has probably, also, been pursued down the street with ever decreasing prices. This was one vendor who wasn't about to do that. Apparently he sources his bamboo from tribesmen who live in the forest miles from any roads. He leaves his motorbike at the edge of the forest, walks to where they live, and then spends two or three days with them during which they show him the best plants. He told me this towards the end of my second, and final, lesson, not as part of the sales pitch. The bamboo is stronger than my previous flutes. It is not as thick as either of my shakuhachis but is of a different variety. 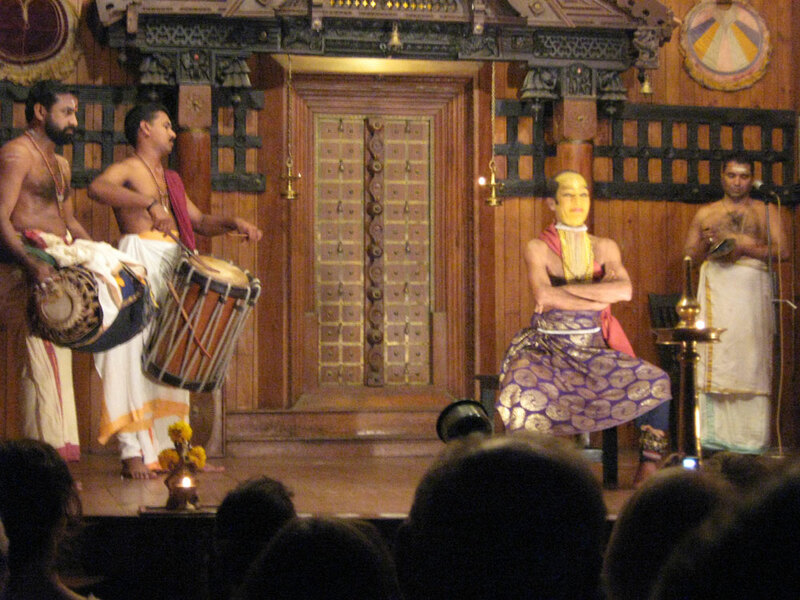 I have a shakuhachi in F, less than two inches longer than Venugopal's flute (fundamental G). 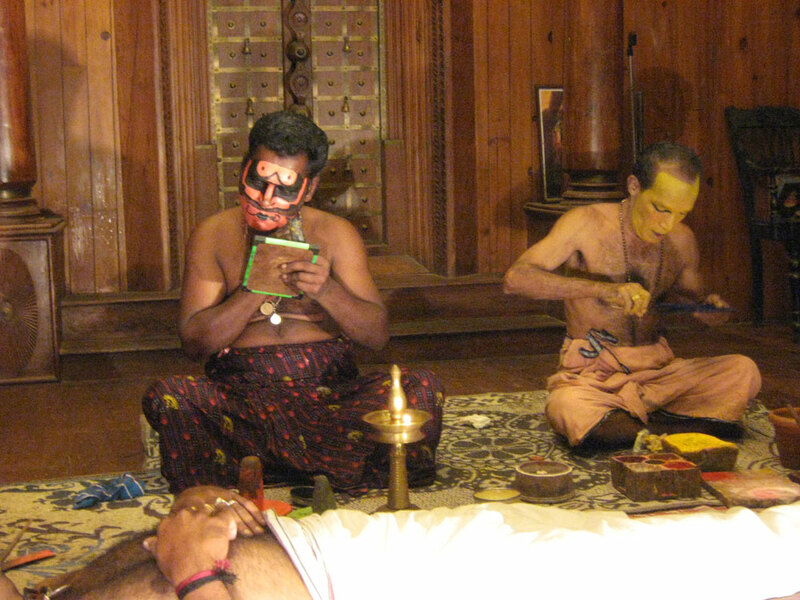 The shakuhaci has five 'segments' whereas the Indian flute has only one. Venugopal insisted the flute was in C and it took me a while to realise that he takes the tuning from the middle, where only the thumb hole and the upper three finger holes are closed. This note is indeed C, but produces a Lydian mode if a scale is based on it. The lowest note is G and this produces G major if no half holing takes place. And the term 'half-holing' also caused some confusion when I used it in relation to producing semitones, as the amount of hole uncovered to produce them is rarely half. We concluded the deal, played a bit for each other and posed for the photo, below. 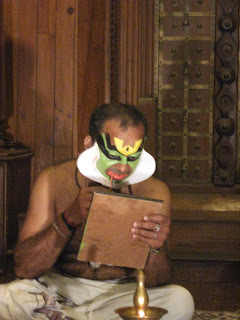 It was only a day or two later that it occurred me to seek him out and have a lesson or two in South Indian flute technique. We left Fort Cochin by taking the ferry across to Ernakulam. 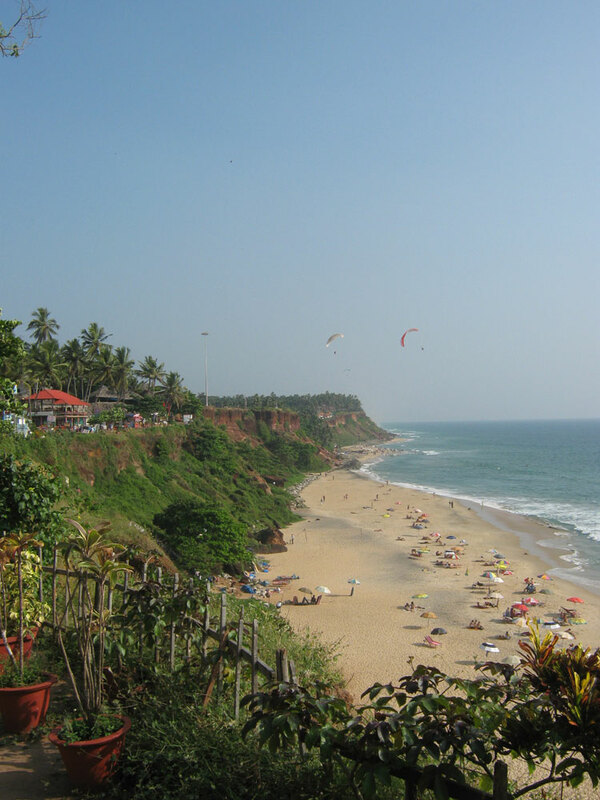 From there we took a train south to Varkala, a small town with an important Hindu shrine on the coast, just a short rickshaw ride from the station. The temple and shrines are about 300 metres from the beach. 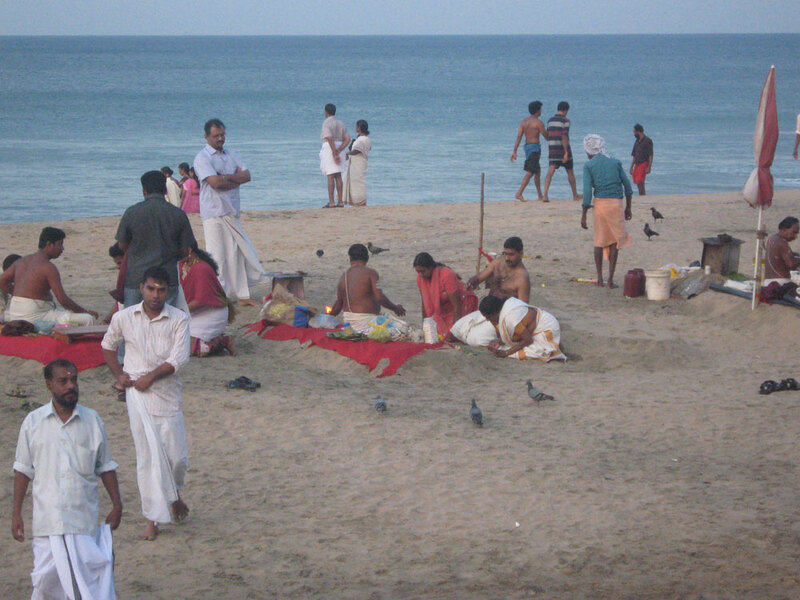 At the beach itself the devout spread the ashes of the deceased and then return in subsequent years to do puja (prayer/ceremony). 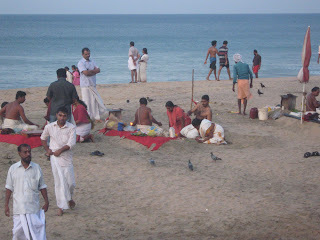 To facilitate this, the Brahmins create altars from the sand on the beach. The real action at this beach takes place at dawn and immediately afterwards. (Still rather jet lagged it was a few days before I discovered this.) A mere 50 metres north of this beach, and separated only by easily negotiated rocks, is the tourist beach. This is populated predominantly by sunbathing westerners in trunks or bikinis. The Indians would also visit, taking to the waters of the Arabian Sea fully clothed, as is their custom. On the cliff above this beach are the small, low rise hotels (ours boasted four rooms) and makeshift restaurants. The access to these is by a footpath wide enough for delivery rickshaw but little else. The taxis and other rickshaws deposited their human cargoes at the car park at the end of the cliff path. I enjoyed the respite from car horns, the unrelenting soundscape of roads throughout the subcontinent, and could listen to the mynah birds and the waves. After a few days I saw a man put a bamboo flute to his lips and begin to play. It was the first live flute I had heard since arriving and I was immediately entranced. My previous trip had been to the north and, early on, I had bought a flute for a few rupees that sustained me during my six week stay. So far, this time all I had seen were some insubstantial, overpriced 'souvenir' instruments and I was hoping to find something rather better. Now flute man demonstrated some flutes and was happy to let me try some. He had bigger ones in G and smaller ones in C. My technique at the time was just as I would use on the recorder, using the pads of the final section of each finger to close the holes. 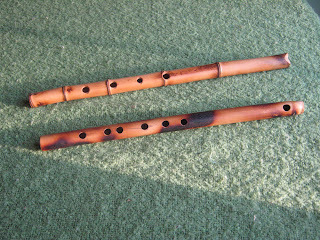 This made it very difficult to close the holes on the G flutes so I gravitated towards the C instruments. 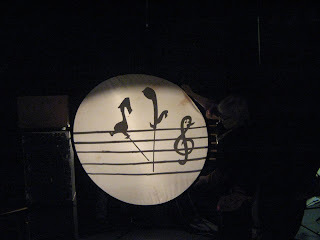 The intonation was true, at least relative to the instrument. And the musician, who was also the maker, surprised me by taking an electronic tuner out of his bag to validate the tuning. Now buying things in India is not like it is in England where, unless it's a second hand car, one tends to accept the initial price. In India some things are 'fixed price' while others, especially from stalls or independent traders, are negotiable. For the flute I had taken a fancy to, Venugopal would usually (he said) charge 2,000 rupees - about £25. In India this is an enormous sum - our hotel rooms, doubles, were costing us £3.50 a night each. For me, because he recognised me as a musician, he was prepared to let it go for 1,500 rupees. So was he just flattering me? Was this a good price? Was I going to let the tourist's constant fear of being ripped off come between me and a fine instrument? I have just found a clip of Venugopal on Youtube that makes me think that although compliments came easily to him, he may have been pleased that one of his flutes might go to someone who could play it straight off. Starring Clara Bow and Charles 'Buddy' Rogers, it also gave an early outing to the great Gary Cooper. The only silent movie ever to win an Oscar, it came right at the end of the silent era and by the time it received its award, talkies were already the new sensation. Of course silent films were never really silent. Even the smallest venue would have someone playing a piano. 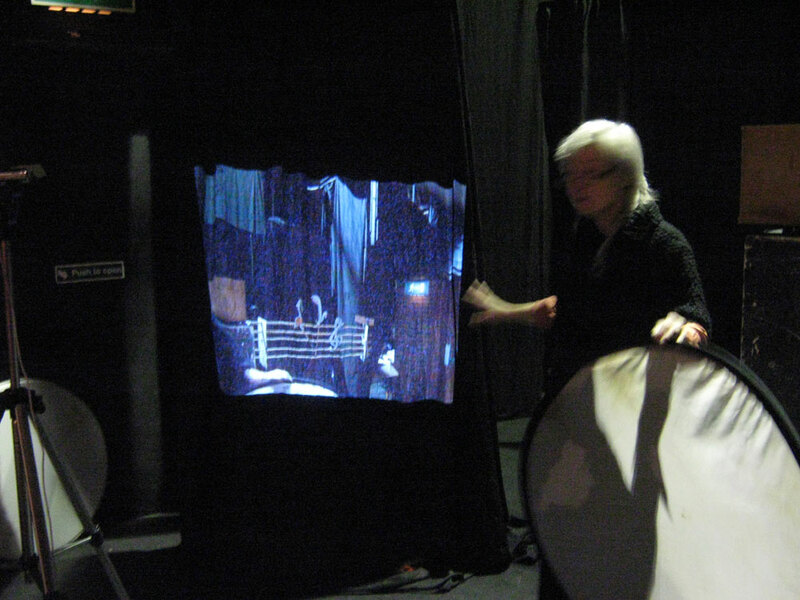 The biggest theatres would boast an orchestra and sound effects. 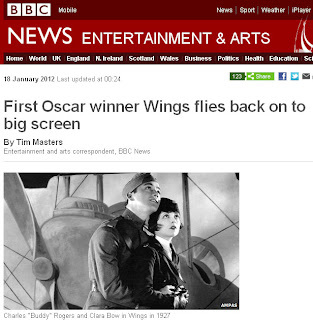 A BBC news item caught my eye today. 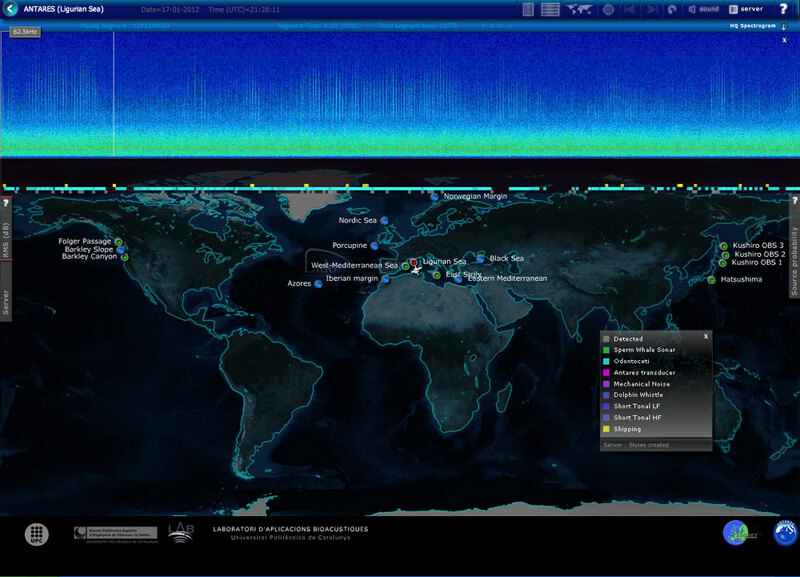 It concerns oceanographers in Vancouver who have an underwater listening array. Apparently the US military are unhappy about the scientists' practice of allowing anyone at all to listen, live, to the microphones, in the way that you might monitor a webcam. The US navy carries out manoeuvres in the waters off the Canadian coast and is concerned that anybody can listen to the distinctive sounds of its ships. Apparently the navy now takes the sound and 'scrubs' it before returning it to the oceanographers for general consumption. There are other stations broadcast a live feed and you can find, and listen to, them at http://www.listentothedeep.com/acoustics/index.html I can't say I've heard anything spectacular yet but it's interesting to tune in for a while. Perhaps the US navy's edit will provide us with some highlights. The BBC article does just that. 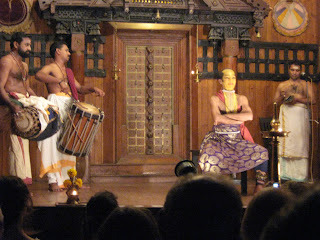 I have recently returned from India; a fortnight or so in Kerala and Tamil Nadu. It was a family visit so perhaps not as much music as I might have otherwise have pursued but nevertheless I encountered plenty. I left home in Norwich in the small hours on the back of a jazz gig over in Great Yarmouth. 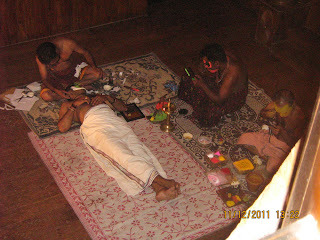 I arrived in Cochin at the end of a particularly long day at about 5.30am, local time. Having been advised to stay awake until local bedtime, that first day is a bit of a blur. 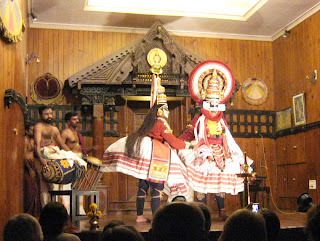 However, our host at the homestay suggested we go and see a Kathakali performance that evening. Although watching the performers apply their make-up was fascinating (it took them over an hour) and the live drumming and percussion was a treat, I confess I kept nodding off during the dancing as I struggled against loss of sleep. I was a better audience for a sitar and tabla recital in the same venue the following evening but I couldn't persuade the rest of my party to come along.